I take most TV adverts with a pinch of salt but BT’s current broadband advert contains a completely irrelevant claim. It claims that their service provides “unbeatable wireless speed” in the UK. This is the equivalent of your electricity provider claiming their electricity produces warmer light or your gas provider saying it heats your room more efficiently. Which wireless router or access point (if I choose to actually use wireless) is up to the customer and will therefore determine the speed. This claim obviously plays on the consumer broadband mentality that suggests you are tied to the router provided by the ISP. Even if BT’s router is wireless-n it would be foolish to choose your ISP based on the router they provide. At any rate, a fantastic wireless speed is irrelevent if the connection provided by BT is only a fraction of that. 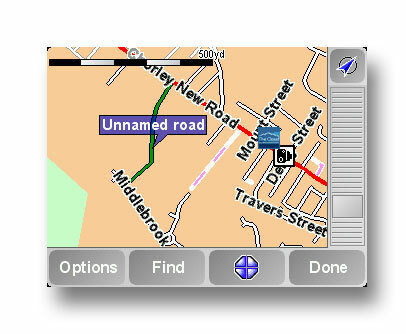 SatNav maps are only as good as the map data on which they are based. Inevitably errors will creep in and roads change. TomTom GPS units have a feature called MapShare which ostensibly allows you to report any such errors to allow the maps to be corrected. This may well be a phantom road – a deliberate mistake put there by TeleAtlas to catch out anyone who decides to copy their maps. The problem is that the TomTom will try to use this road as a route. SatNav units often come in for some stick when they route drivers down none-existent roads, but if the suppliers fail to fix these errors, despite being told about them several times, it is hardly surprising. Love the way he calmly sets up his next shot.